Applicants are invited to apply for a PhD position in mechanical engineering at Technical University of Denmark. This position is available for 6 years. Applicants should apply before October 31, 2018. DTU Mechanical Engineering in cooperation with NTNU AMOS – Centre for Autonomous Marine Operations and Systems has an open PhD position in ship motion dynamics coupled with the subfields of estimation theory, and data analytics and communication. The multidisciplinary PhD project will address sea state estimation using a network of heterogeneous sensors, which, on a more specific level, involves network-based sea state estimation using simultaneous data from multiple ships. The PhD study is under the Double Doctorate Degree (cotutelle) agreement between NTNU (Norwegian University of Science and Technology) and DTU (Technical University of Denmark). Safe and efficient operation of marine vessels is key, independent on the actual context; for instance, navigation in rough weather and severe seas, inspection and maintenance of offshore windfarms, and drill operations for oil and gas exploration. The most important (compromising) factor in this regard is the wave system experienced during the operation. It is therefore essential to possess knowledge about the onsite wave system, or generally the sea state, since predictions and analyses of wave-induced loads and responses otherwise cannot be made. And, it should be clear that with the future's autonomous ship it becomes even more important to have reliable estimates, in real-time, of the onsite sea state; realising that human 'interference' and gut feeling - normally securing safe and efficient marine operations - have been taken out of the loop. The overall objective of this project, and potential future succeeding elaborations, is to study the use of various available means for sea state estimation (SSE). Typical means for SSE include free-floating wave buoys, remote sensing, wave radar measurements, and ship-as-a-wave-buoy, all of which are usually applied on an individual basis. This project should target the use of the (heterogeneous) means by fusing together combinations and/or several of the individual observation platforms in a single combined network. It is anticipated that the project focuses on ship-as-a-wave-buoy as the observation platform. The candidate may find supplementary background information here. The project and its scientific contents are expected to cover classical ship motion dynamics coupled with data analytics and network theory. The successful candidate will manage to produce results that improve real-time SSE on both a local on-site position and on a more global geographic scale. Furthermore, successful results may depend on the possibility to add (un)certainty measures on the SSE, based on uncertainty modelling and/or weight ratings of estimates from the individual observation platforms. In essence, the project/candidate is responsible for conducting a study that will benefit towards 'Maximized operability and risk management of ships and ocean structures'. The project will be followed closely by prominent industrial partners of NTNU AMOS, including DNV GL, Equinor, and SINTEF Ocean. The candidate will be in direct contact with the industrial partners, and may likely be doing collaboration-based researchers pursuing a successful project. This scholarship is co-financed by The Danish Maritime Fund. The candidate must have a master's degree in naval architecture, control theory, or mechanical engineering; emphasizing, however, that applicants with a specialization in ship motion dynamics will be prioritized. Besides, it will be to the benefit of the candidate with a good background in signal processing, sensor and information fusion, and estimation theory. The scholarship for the PhD degree is subject to academic approval, and the candidate will be enrolled in one of the general degree programmes of DTU and NTNU. For information about the general requirements for enrollment and the general planning of the scholarship studies, please see the DTU PhD Guide and NTNU PhD Guide. DTU is a leading technical university globally recognized for the excellence of its research, education, innovation and scientific advice. We offer a rewarding and challenging job in an international environment. We strive for academic excellence in an environment characterized by collegial respect and academic freedom tempered by responsibility. Both NTNU and DTU are leading technical universities in northern Europe and benchmark with the best universities in the world in the particular area. This PhD study is under the Double Doctorate Degree (cotutelle) agreement between NTNU (Norwegian University of Science and Technology) and DTU (Technical University of Denmark). DTU will be the home institution that will handle all the administrative and financial aspects of the joint education. DTU will enroll the candidate in one of its PhD programmes and nominate the main supervisor. NTNU AMOS will be the host institution and will enroll the candidate in the Marine Technology PhD programme. The candidate must spend a minimum of one year at each of the two institutions. Employment is expected to be from about March 2019, but this will be decided with agreement between the candidate and the group of supervisors. Further information may be obtained from Associate Professor Ulrik Dam Nielsen, udn@mek.dtu.dk or telephone +45 4525 1970. You can read more about DTU Mechanical Engineering on www.mek.dtu.dk/english and about NTNU AMOS on www.ntnu.edu/amos. - Two letters of recommendation from professional referees. At DTU the present research project will be carried out at the Department of Mechanical Engineering in the maritime group of the Section of Fluid Mechanics, Coastal and Maritime Engineering. The research of the maritime group includes among other topics ship responses in waves and monitoring and decision support systems for ship safety. Work on the former topic has focused on theoretical predictions as well as estimates obtained from measurements, and combinations. Work on the latter topic has elaborated on 'sensor fusion' and fault tolerant solutions and approaches. 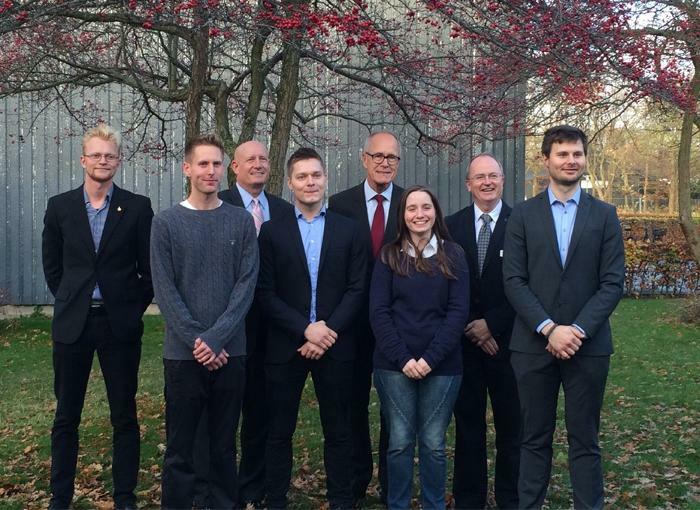 At NTNU the present research project will be carried out at NTNU AMOS – Centre for Autonomous Marine Operations and Systems. The centre educates and conducts research about methods and techniques which facilitate the assessment and development of technical and operational solutions for Norway’s biggest export industries: oil and gas extraction at sea, ship technology with corresponding equipment industry, fisheries technology and aquaculture technology. The research and education at NTNU AMOS emphasize the development of environmentally friendly and energy-efficient solutions within a number of areas, related to safe and efficient marine operations, including 'Maximized operability and risk management of ships and ocean structures'. This particular area is one of the core areas of NTNU AMOS, and several PhD studies, including this one, will be completed within the topic in the next 3-6 years. NTNU is the largest university in Norway, and it has the main responsibility for higher education in technology in Norway, and it is the country's premier institution for the education of engineers. The university offers several programmes of professional study and a broad academic curriculum in the natural sciences, social sciences, teacher education, humanities, medicine and health sciences, economics, finance and administration, as well as architecture and the arts.